CORA AND THE REREADS is where I reread and review a book. Sometimes a book is so awesome you have to pick it up again. Sometimes you feel like a different person than you were when you first read it. Sometimes you just need to read that book again. 5 Words: Crime, punishment, family, revenge, justice. 5 More Words: Power, hate, love, hope, prejudice. I've said it before and I'll say it again: This book is like Marmite. You'll either love it or you hate it. This is actually the third time I have read this book. The first time I finished it I flipped right back to the start and read it again. This time I'm refreshing my memory before Perfect comes out and seeing if it's everything I remember. Reader? It is everything and more. One of the things that struck me most about Flawed when I first read it was that it was written with passion and real conviction behind the message. On rereading this was even more evident. 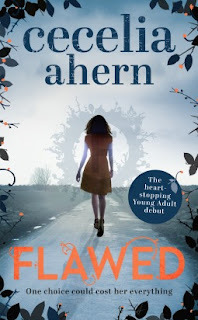 Flawed does not pull any punches, it is vicious and shocking, so much so that even on rereading I had to put it down and step away, shaking, to calm myself. There is one scene about 1/3 through this book that makes me feel physically sick, like I can't catch my breath, that makes me tremble in fear and anger and repulsion. It is brutal. But it is integral to the plot, the turning point that changes everything. And I could not stop reading. I love how reading this again meant that I saw it in a slightly different light. By the end of the book the words Flawed and Perfect had completely deconstructed and redefined. Right from the off, the word Flawed is used a lot. In fact, it's used over 300 times. This repetition first enforces the original meaning, then makes it meaningless, then turns it on its head. It is powerfully written. If you have not read this book, what are you waiting for? It was so good that I had to put it down. I bought this book but still haven't read it. My sister read it first though, and she really liked it. I have a queue of books in my TBR list, but your review is tempting me to read it now! The way you've described it is so INTRIGUING! Definitely going on my list!